On Tuesday, a 7.7-magnitude earthquake hit Pakistan. In its wake, it has left over 350 people dead, 619 injured and 21,00 homes destroyed. Earthquake destruction is devastating to say the least. But it also gave birth to an island, just off the coast near the town of Gwadar, about 230 miles southwest of the quake’s epicenter. It’s not really an island, it’s actually what geologists call a “mud volcano,” which is caused by the pressure of sediment breaking up out from underneath the seabed. 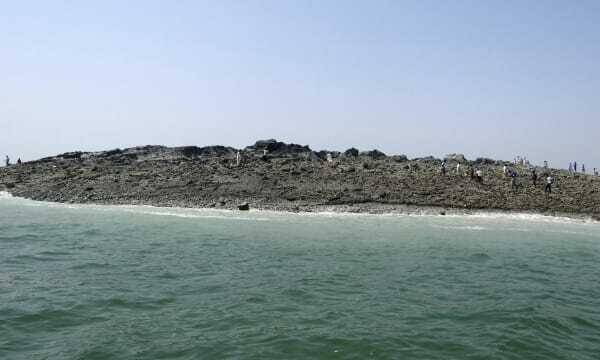 Basically an island of sand and mud, the mud volcano could last for anywhere from a couple of months to a few years, meaning it’s not here to stay long-term.According to local reporter Bahram Baloch, the island is about 250 to 300 feet in length, and about 60 to 70 feet above the water. You can walk on it, visitors to the island have also said that it is emitting flammable gas. Within half an hour of the earthquake, inquisitive locals flocked to the island, which according to Rashid Tabrez, the director-general of the Karachi-based National Institute of Oceanography, is the fourth in the region since 1945. Geologists attribute that to the continuing process of continental drift that originally brought the Indian subcontinent to collide with Eurasia. In fact, 700 kilometers to the east of this new mud volcano lies the Makran coast, an area characterized by high seismic activity, and home to several other mud volcanoes. The Gondogoro La trekking route, located in a remote region of Pakistan, is considered one of the most demanding and beautiful hikes in the entire world. The path often draws adventure travelers from across the globe, most of whom come for its legendary mountain views that are amongst the most spectacular on the planet. But in May the route was suddenly shutdown by the Pakistani government without explanation, preventing travelers from visiting the region and putting the fragile local economy in a bind. The trek traditionally begins in the village of Askole and winds its way up the Baltoro Glacier before crossing over the Gondogoro La Pass into the almost completely uninhabited Hushe Valley in northern Pakistan. The route rises to a height of 19,488 feet and offers stunning views of the Karakoram Range that at one point includes four peaks of more than 8000 meters in height. Those mountains include Broad Peak, Gasherbrum I and II, and the second tallest mountain in the world – K2. While not as crowded or well known as the trek to Everest Base Camp or a climb up Kilimanjaro, the Gondogoro La route is nonetheless quite popular with hikers and climbers visiting Pakistan. The trail is well known for being technically challenging and can require more than three weeks to complete, depending on pace, weather conditions and the experience levels of the hikers. It is not unusual for the route to be closed as avalanches have sealed off the path in the past. But this time the Pakistani government has simply stopped issuing permits for the trek on May 23 and hasn’t been particularly forthcoming as to why. The route does wander close to the border with both India and China, although the mountains make it nearly impossible for someone to cross into one of those countries from Gondogoro La. There is some speculation that the move was made for security purposes, although there have not been any indications of what security threat may exist in the area. Many adventure tour companies in Pakistan rely on regular hikes along the Gondogoro La trail for steady income, as do the small villages that fall upon the route. With the path closed off there is very little income, even now at the height of the tourism season in Pakistan. Tour operators are increasingly frustrated by the lack of information about why the trail was closed and how long it will remain that way. Many of the guides and porters that traditionally work the route are now unemployed, while small inns and teahouses remain empty. The closing of this route predates the shutdown of Nanga Parbat, the mountain where militants killed 10 foreign climbers recently. Whether or not a similar faction is operating in the Gondogoro La region is unknown, but it is possible that the government has ceased to issue permits in an effort to keep travelers safe. This part of Pakistan has a history of being peaceful and receptive to visitors, so hopefully this closure is only temporary and adventurous trekkers can return soon.